Multiplex My Gym: All the World's a Stage | Gym & Theatrical Equipment | QSD Inc.
Pageants, plays and musical performances. Your gym can be transformed for those special presentations that happen throughout the school year. And when the curtain closes, it all packs up and gets put away until the next time. 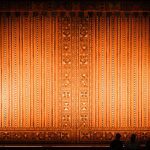 QSD’s stage curtain fabrics elevate the quality of your theatre and performance spaces. Regardless of the size of your project or budget, contact our experts for fabric recommendations. As for track hardware, the right choice begins with quality. From curtain hooks to curtain brackets and everything in between, QSD offers curtain hardware that is both durable and reliable. We can advise you with everything from choosing the right nuts and bolts to setting up the finished product. Every production needs a stage, and at QSD, we supply two great options for anyone looking for portability. Our Express Deck and Alpha Deck offer easy-to-use, transportable stage platforms, suitable for a wide variety of events. From graduations, concerts, theatrical productions, we have what you need. Not just for trade shows, our pipe and drape solutions give you maximum versatility. From masking off the wings, to skirting for the stage itself, our various drape heights cover it all. 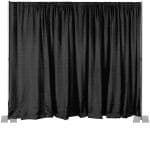 We also have specialty fabrics for audio-visual and scrim applications. All of our products are custom sewn per customer specification. Alternatively, you can purchase the raw fabric to do your own customizations. Pipe grids are usually used for permanent, suspended lighting needs. Much of the same hardware can be purposed for pylon-mounted solutions, and all of the connecting brackets are the same. Connect with one of our skilled outfitters for the most appropriate solution in your situation. You can achieve professional functionality and aesthetic appeal with our pipe grid hardware solutions. A standard setup works well for many spaces, but we can also customize your system to make sure it works best for you and fits your needs. 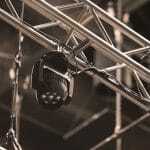 A pipe grid can be used for more than just lighting and technical applications, or a theatre curtain track system. Sectional, roll-away bleachers are ideal for locations where only temporary seating is required. The welded frames are constructed with aluminum angles, and planking is 2″ x 10″ extruded aluminum. 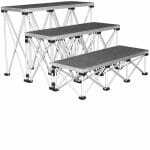 Each unit is 9′, 15′ or 21′ long, and has three rows of seating and includes non-marring swivel casters and pads to prevent scuffing or marking of floors. Imagine how these flexible solutions will beef up your drama and music programs. At QSD, we have your covered, from portable stage platforms, bleachers, pipe and drape, to proscenium frameworks, curtains and lighting grids. Give amateur theatre the professional touch. Contact us today. Products and service designed to keep your school top of mind for flexible and accessible public performance spaces.